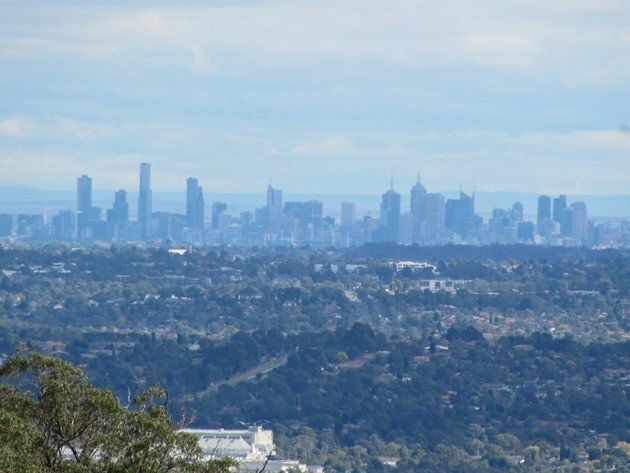 Having established that there are regular trains from the city of Melbourne to the Dandenong Ranges National Park with a weekend all day train ticket capped at $6 per person it made sense to head that way once again. Although only just over a week had passed since our last visit the temperature was a good ten degrees less than our previous visit and the birding was quite different. We arrived a bit earlier in the day on this trip and decided to be ambitious and do some more trails with more gradient. 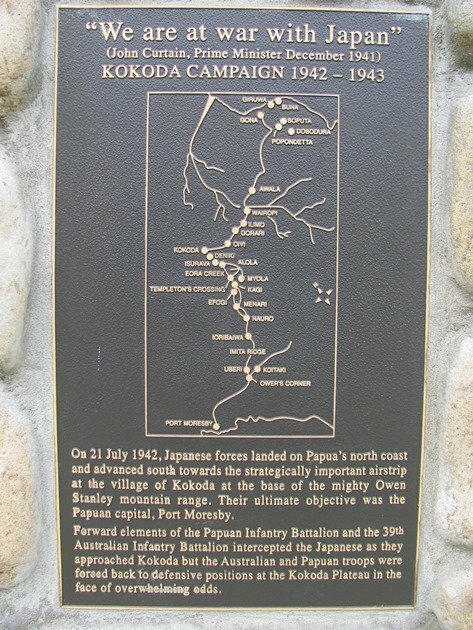 It is important to print off a map prior to heading to the Dandenong Ranges National Park if you don’t have a phone with maps on it. There are named/marked tracks, but there is not a map at any junction and you may get lost without a map. Another option would be to photograph the map at the car-park and refer back to it as needed. Our walk on this visit started by heading along Belview Terrace around the hill with a good view of the city in the distance as you can see above. Our first rest to catch our breath we were greeted by an Australian Magpie and we could see Sulphur-crested Cockatoos flying through the valley calling loudly. Grey Shrike-thrush were more prevalent this time and Spotted Pardalotes called constantly. As I moved in on a heavily camouflaged Crimson Rosella hoping to improve on the photo from the last visit I observed a glimpse of a Wedge-tailed Eagle soaring by through the trees. 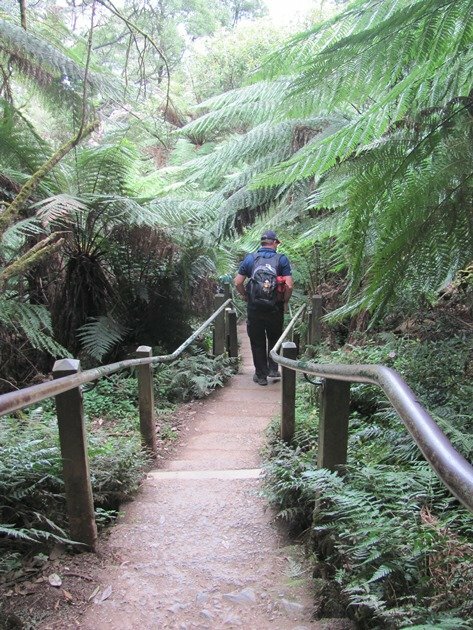 We then took the Boulevard Track and onto the Feather Track which presented us with a good collection of Tree Ferns followed by the Stony Rise Track, which is exactly as it is worded. It was the only narrow and rocky track of the day and would be harder work descending than ascending. Stopping to catch our breath we encountered several Golden Whistlers in this area. 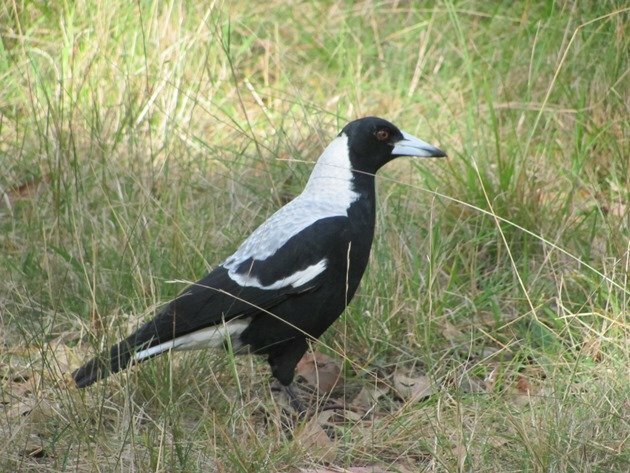 The track ended at a meeting point for several tracks and a Laughing Kookaburra was watching the walkers pass through the forest. We took the Macedon Track to join the View Track and saw several White-throated Treecreepers and ascended further to join the Tysons Track all the way to the top of One Tree Hill Picnic Area. Brown Thornbills, Striated Thornbills and Grey Fantails were challenging due to the height of the trees once again! I had the opportunity to improve on the Eastern Yellow Robin photo from our last visit and failed miserably when it took off. If you have ever wondered what the rump of an Eastern Yellow Robin looks like then I can show you! There is a car-park at the One Tree Hill Picnic Ground for those travelling by car and fresh water and toilets are available. We needed our hot drinks from our thermos by then, because it was even colder at the top of the hill. We viewed the memorials to the Kokoda campaign and then we set off on our descent of the hill. 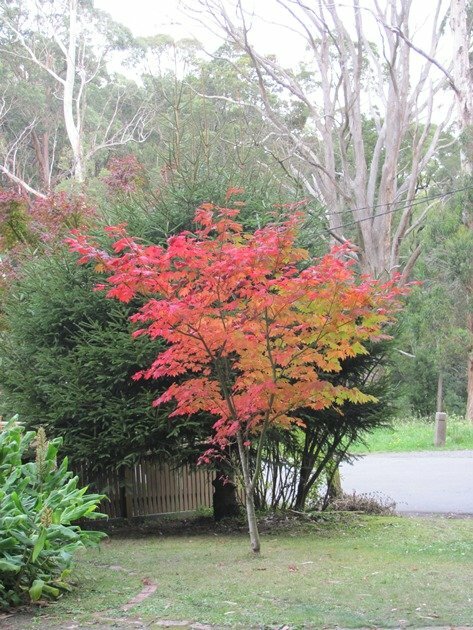 Just before we made the decision to take the thousand steps route to the lower area we encountered a sign of autumn being upon us in the form of trees changing their leaf colour. The steps were very busy with people attempting the trail in one or both directions and there was evidence of a bird of prey at work in that valley. 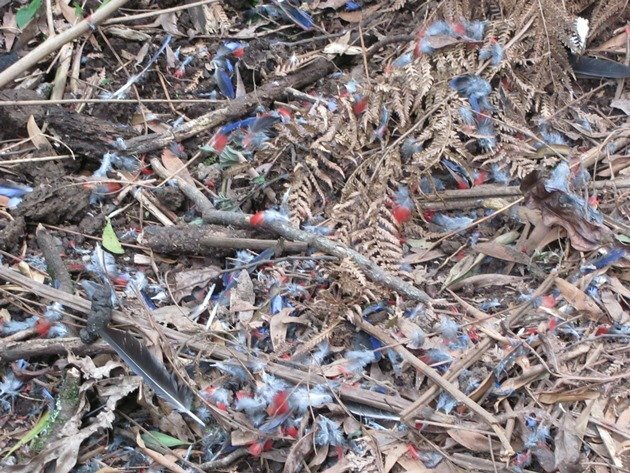 On two occasions we noticed a pile of red and blue feathers that could only belong to a Crimson Rosella. We have seen Peregrine Falcons since we have been in Melbourne and no doubt there are other raptors in the area too. We reached the base of the thousand steps, which we did not count, so trust that there are one thousand of them! 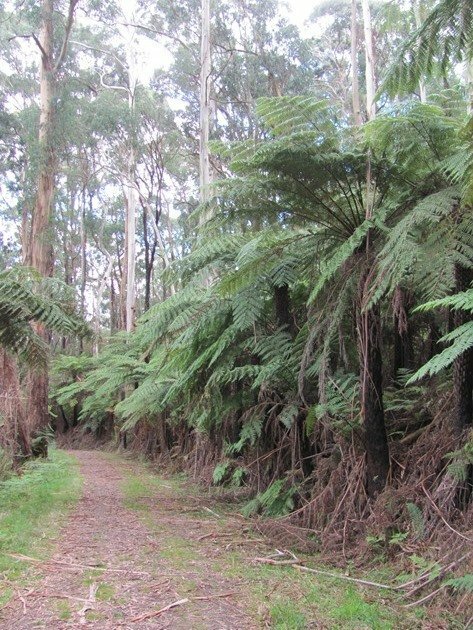 Our next trail was the nature trail that we had taken on our last visit and that had also changed and there were no longer Eastern Whipbirds on the ground feeding. All of the Eastern Whipbirds on this visit were calling from high up in the canopy with their whip-cracking call. The White-naped Honeyeaters were still present in the area and the White-browed Scrubwrens were busy flitting between the bushes in the undergrowth. 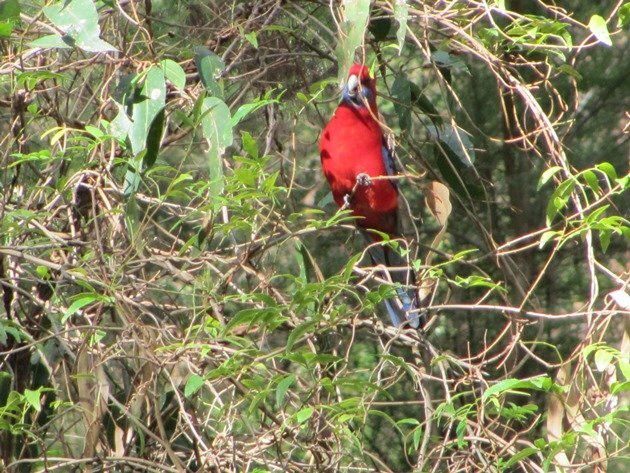 As we approached the stone huts near the end of the nature trail we noticed one Crimson Rosella in a tree and then its partner came out of the tree trunk, so we presume they may be nesting. 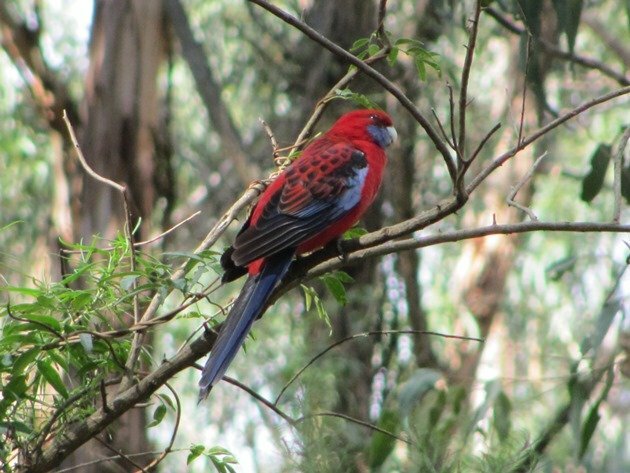 It gave me a better opportunity to photograph these brightly coloured birds, which blend so well into the tall trees. We also observed a female Flame Robin and just as we were descending to the picnic area to return to the train station at Upper Ferntree Gully we both got excellent views of a Wedge-tailed Eagle. We are used to observing Wedge-tailed Eagles in big open skies in the north of Australia or eating carrion on the highway. This was so distant compared to what we have encountered in the past, but still a beautiful sight to see such a large bird soar through the sky. Once again this was a good birding trip on public transport to see some bush and the birds on offer around Melbourne. 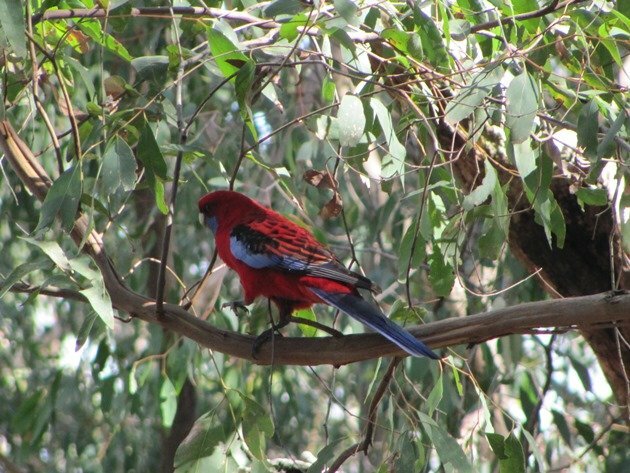 Those “heavily camouflaged Crimson Rosella” sure are hard to spot. 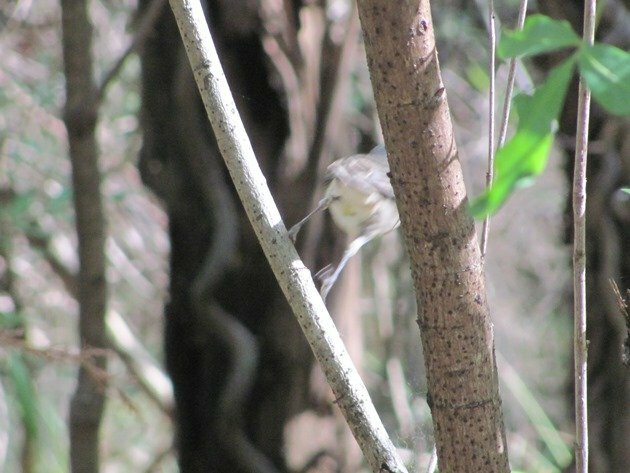 You’ve got it bad in Australia, while all we have to do is spot brown warblers in brown reeds or green warblers amongst green leaves. Where Are You Birding This First Weekend of December 2011?